← What Do You Do with Dirt and Trash of One Billion People? Namaste! This is one of my favorite stories of four rickshaw drivers who touched my life! From day one in India , we have had a love/hate relationship with the rickshaw/tuk-tuk. It is cheap transportation…$0.20 for one way to Cept University. The most expensive rides have been $2.00 and we are still alive after 45 days. Cheap, safe? What is the hate side of the story? Well it scary, that’s what. Rickshaws going in all directions. Yes, the wrong way. Cars are on the left side (thank you British) and rickshaws squirm in and out and sometimes on the wrong side of the wrong side traffic! It is a lot like Mario Cars video game but it is real. I told David I would never criticize his driving again…a promise I hope I can keep. I mostly close my eyes and pray. Not a bad idea in any circumstance. Please watch the video on YouTube of crazy rickshaws in Varanasi. There was no footage taken in Ahmedabad, and Varanasi was the worst, crazy traffic I have seen. Here is the best of the worst! Notice auto as well as man pulled rickshaws. In Ahmedabad, there are none of the people-powered ones. They are a throwback to ages ago, yes from the British. Now I want to tell you four short tales of rickshaws and drivers, along their daily drives on the roads of India. The first tale was weeks ago, shortly after we arrived. A strike was called for drivers to protest for 72 hours because of the rise in fuel prices. This price rise would increase the minimum they had to charge and theoretically they would have less business. I was going with a visiting Canadian professor to NID, National Institute of Design. 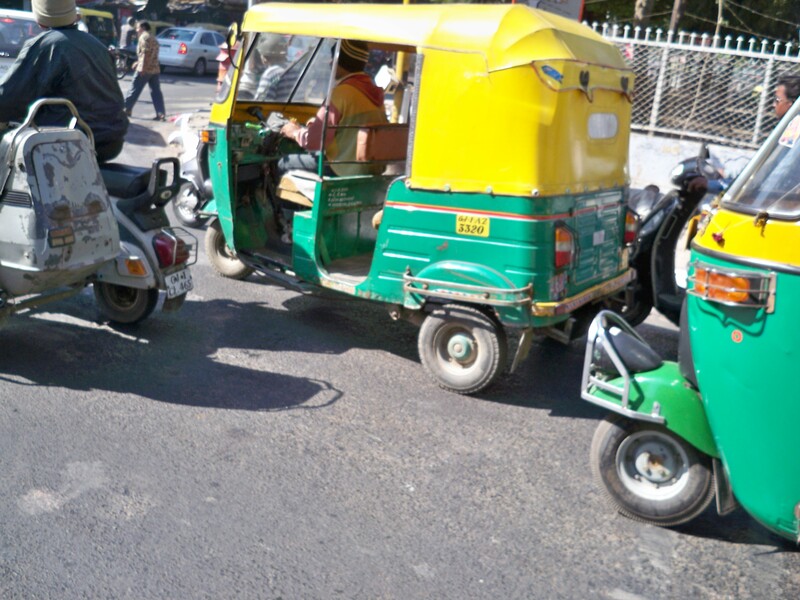 We noticed there were fewer rickshaws, and fewer who would stop, and NID is way across the city. Finally, a young man stopped for us. We entered and he said, he would have to take us by a back route to avoid the strikers. He said he was saving money for college, warming the hearts of two visiting teachers. As we reached our destination, and exited to pay the driver, suddenly three thugs ran up as we stood right there paying and started pounding on the small rickshaw driver. Skye, her student, and I started yelling, “Stop, stop,” and after a few moments they ran off as quickly as they had appeared. The driver was badly shaken but not badly hurt. As we entered the grounds, we looked back to see him sitting with his head on the wheel, not driving away. One morning, I was catching a rickshaw on my own. A beggar women approached and started patting me as she pulled on my sleeve. This is quite distressing to me and what she wants. But everyone says not to give them money because it goes to someone they are begging for. This seems to be true because we have given beggars food left over from dinner that we had parceled for them, and after taking the food, they still ask for money. The driver said something to the old woman and she moved up next to him. He took a coin from his pocket and gave it to her. It reminded me of the “poor widow’s mite offering” from the Gospels and how that pleased God. The third tale happened one night David and I were returning from dinner. We had gone to Souk for some hummus. The ride was uneventful and we got out to pay when the driver replied to David’s inquiry of the price, “No charge Uncle, welcome to India!” We were very touched at his gift to us, given from the goodness of his heart… caring for strangers. The last story happened just a few days ago. We had arrived at the end of our lane and David was paying. The driver said, “No, too much,” and returned 10 rupees to David. He had inadvertently given the driver 30 rupees instead of the requested 20. If you watched the video, you saw images of the poverty in India. Many of these drivers work for someone else, while some have their own rickshaw. Gas is $6.00 a gallon. They are squeaking by, I imagine. There is a rising middle class as evidenced by the TV commercials, but these drivers are not part of it. Blessings for these four men who were kind beyond the call of duty, honest, caring, and friendly to a woman from far, far away. I took this picture of the huge male monkey resting on a scooter in front of the Jain Temple in our neighborhood! The monkeys’ erratic behavior kept us always on the look-out for unexpected photos! 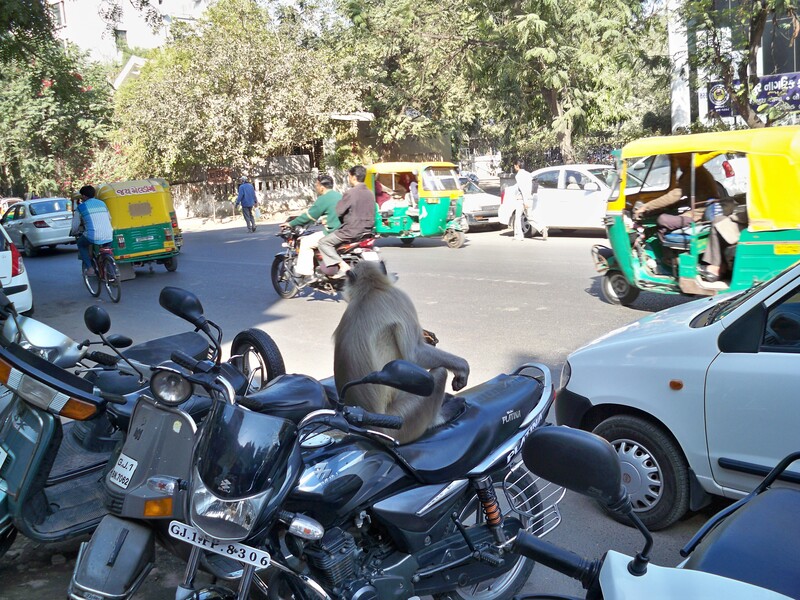 This entry was posted in Amdavad, Animals, India, service, Travel, Uncategorized and tagged Ahmadabad, generosity, Gjururat, India, Indian traffic, kindness, monkeys, rickshaw, transportation in India. Bookmark the permalink.